The FrontPet SUV Cargo Cover is quilted with 600 denier nylon fabric making it thick and well-stitched for long term use.It Is vinyl-backed to ensure that it can properly serve as a water resistant barrier for the trunk of your vehicle. Our unique design allows for our cargo cover to fit in almost any SUV! Use the included clips and straps to make a perfect fit in your vehicle! Take your pet on any trip without having to worry about damaging the inside of your SUV. 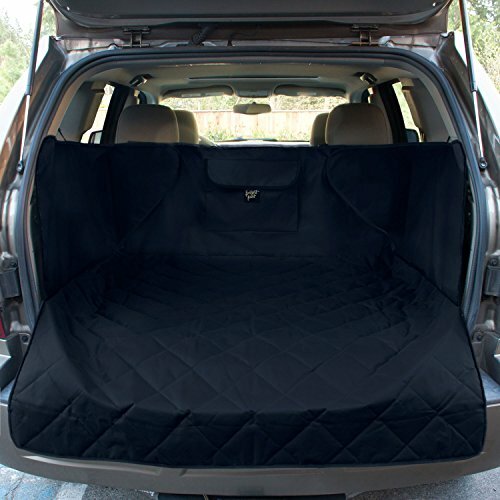 No matter how long or short the ride may be our quilted cargo cover will keep you covered! Our ultra soft quilted design was made with your pets well being in mind so you will not have to worry about discomfort on lengthy trips! Bring their favorite FrontPet Bed for added comfort! Easy to clean nylon make spot cleaning a breeze! Ultra durable 600D Nylon that will hold up to any adventure! CONVENIENT: Large pocket for toys, leashes, bags or anything your pet may need! COMFORTABLE: Quilted padded top paired with ultra comfortable material allows for your pet to ride in safety and comfort! DURABLE: Made with 600 denier nylon with a rubber backing for ultimate protection! SANITARY: Our cover allows you to travel with your furry friend without having to worry about damaging or making a mess of your vehicle's interior! If you have any questions about this product by FrontPet, contact us by completing and submitting the form below. If you are looking for a specif part number, please include it with your message.